The tests listed on this site have been created by Wise Owl Training, based on our 25+ years of experience of providing classroom training courses. For the vast majority of people, the best thing to do is to stick to the tests provided by Wise Owl, and ignore the rest of this page. However, you can create your own test, perhaps to cover an internal system, or something which we don't. Here are some notes to show you what this process involves. For each question you must provide introductory text, a diagram, following text and four answers (only one of which is correct). You'll need to provide a minimum of 20 questions like this, although to be successful a test should ideally have 100 or more. Thinking of good questions - and entering them into the system - takes a fair amount of time! This process is simple and free of charge. Once you've created a test, you'll need to buy tests and invite people to take them (custom tests can't be done anonymously or free of charge). You can see the latest costs here. Typically, each test will cost between £1 and £2.50, depending on how many you buy. 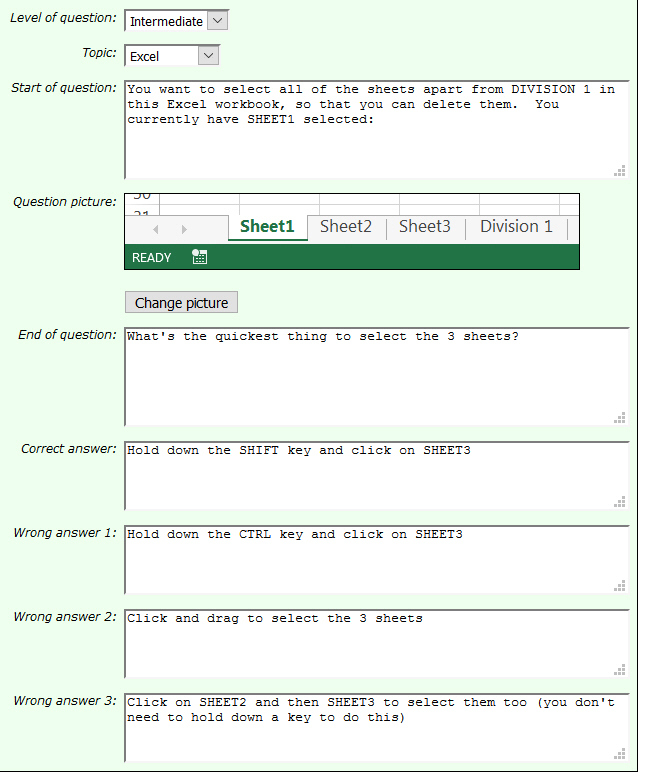 If you do go down this route, we recommend the use of SnagIt for your screen captures (all of the diagrams for our questions were produced using this excellent software).